The Sandpipers were a male vocal trio that recorded a handful of easy listening pop hits in the mid-'60s. The group was distinguished by its light, breezy harmonies, which floated over delicate, breezy string arrangements, as well as the occasional appearance of a wordless female backing vocalist who drifted in and out of the music. Though they didn't manage to have a long, sustained career, the group did have one Top Ten hit with "Guantanamera" in 1966. 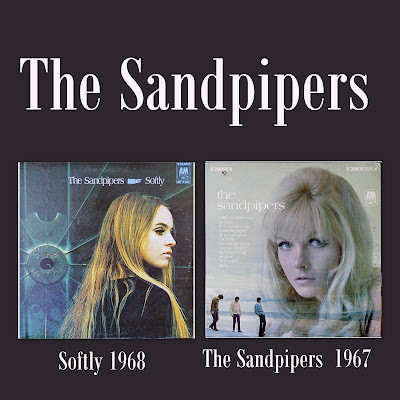 Originally, the Sandpipers were known as the Four Seasons. The three members -- Jim Brady, Mike Piano, and Richard Shoff -- were part of the Californian Mitchell Boys Choir before they formed their own group. Shortly after their formation, they learned that there was a New York group using the name the Four Seasons, so they changed their name to the Grads. As the Grads, they cut a handful of singles, which helped the group secure a residency at a Lake Tahoe nightclub. After the Grads had been performing in Lake Tahoe for a while, a friend of the group introduced them to trumpeter Herb Alpert, who ran his own record label, A&M. Impressed, he signed the group to a record contract. 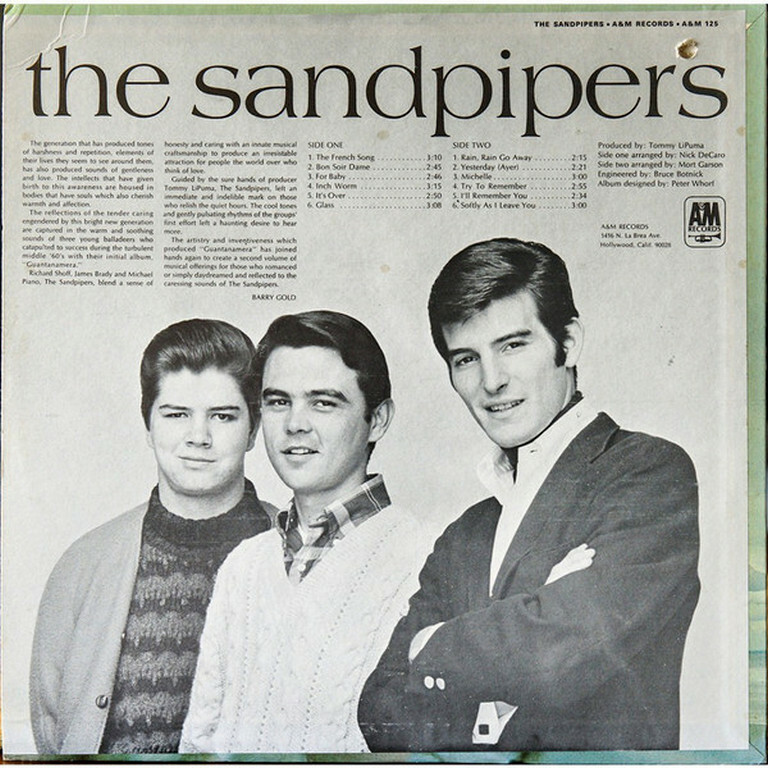 A&M released a handful of singles by the Grads before the trio changed its name to the Sandpipers. None of the singles the group released were successful until their producer, Tommy LiPuma, recommended that they record a South American folk song called "Guantanamera." Once "Guantanamera" was released in 1966, it became a major hit, reaching the Top Ten in both the United States and Britain. 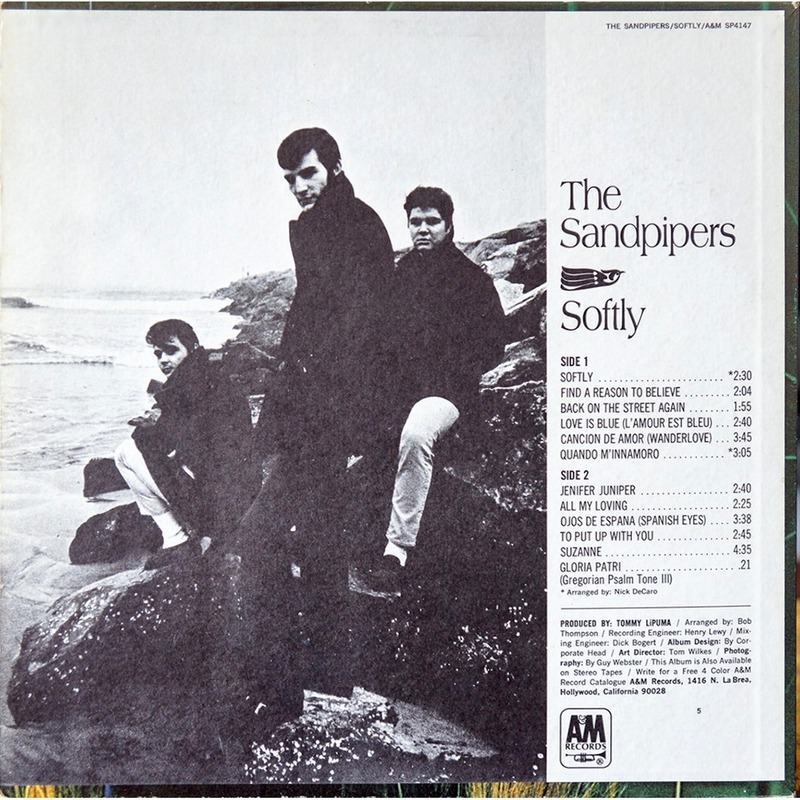 The Sandpipers managed to follow "Guantanamera" with several minor hits, including versions of "Louie Louie" and "Kumbaya." During this time, the group had taken to recording and performing with a supporting female vocalist named Pamela Ramcier. Ramcier contributed ethereal, wordless vocals to the group. Her vocals never acted as harmonies to the group's singing; they functioned in a supporting role, much like the strings that comprised the band's instrumental backing. 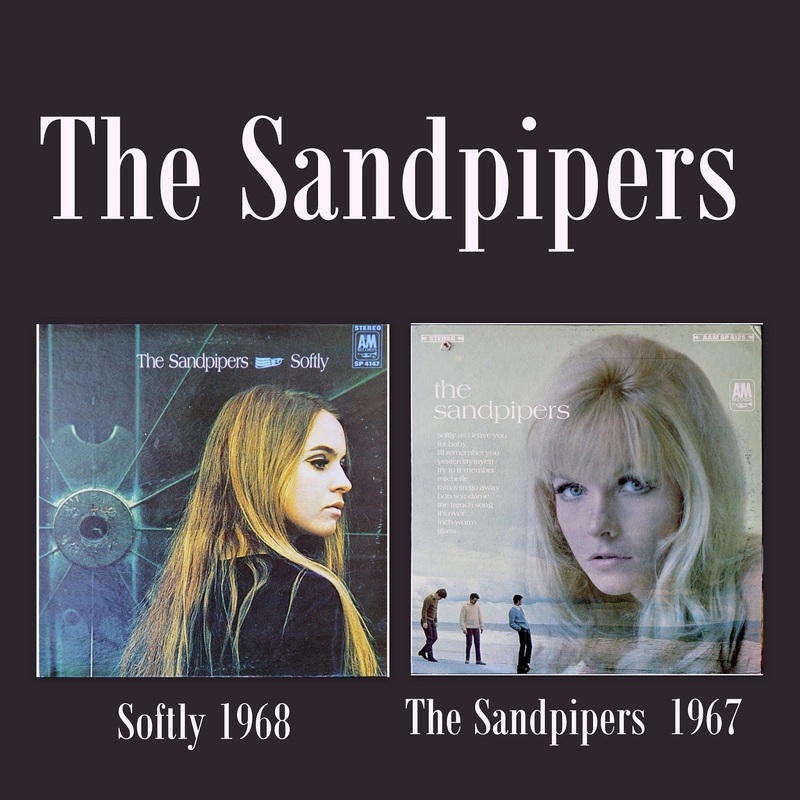 Although Ramcier was never credited on the albums and was always shrouded in shadows during concerts -- though her hip, mod outfits complete with miniskirts and go-go boots often made her more noticeable than the actual Sandpipers -- her voice was one of the most distinctive elements of the group's music. In 1970, they contributed songs to The Sterile Cuckoo ("Come Saturday Morning") and Russ Meyer's Beyond the Valley of the Dolls. Though the Sandpipers continued to record into the '70s, their audience diminished with each successive year. After spending five years without any chart success, the group disbanded in the mid-'70s. Very cool, D&J, love The Sandpipers but what's even more enjoyable is watching the great front covers.